Brain Products provide a range of solutions for neurophysiological research, including EEG hardware and software. Integrating Brain Products hardware with EyeLink systems is very straightforward. Integration is achieved via a combination of TCP/IP communication to configure and control BrainVision Recorder and TTL signalling to mark critical trial events. 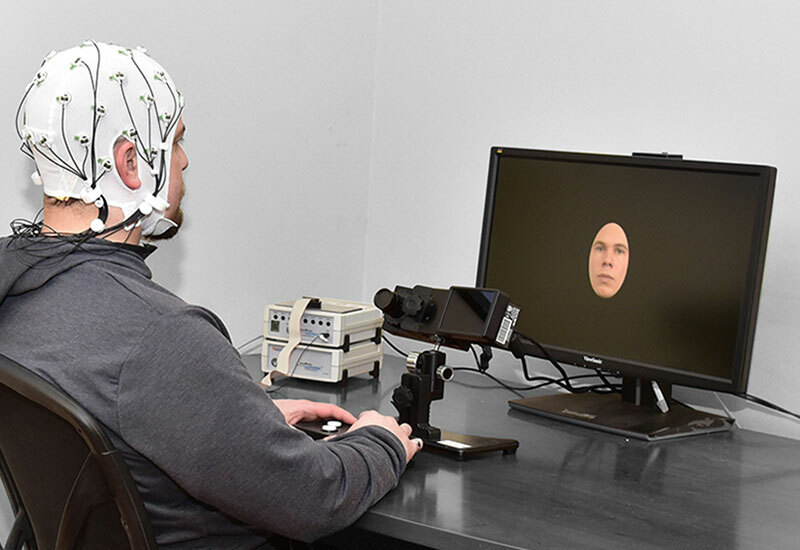 Version 2.2 of SR Research Experiment Builder software has dedicated nodes that simplify integrating Brain Products EEG systems with EyeLink systems. 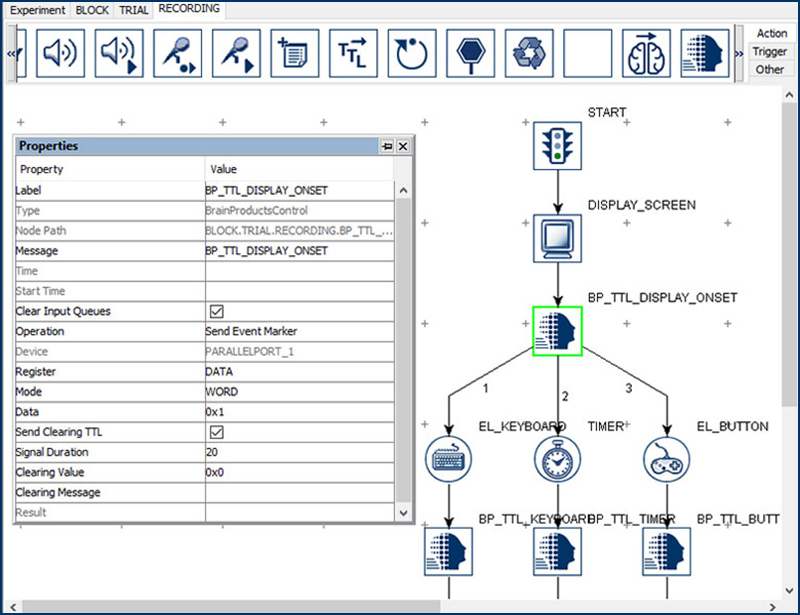 Experiment Builder implements integration with Brain Products EEGs using Remote Control Server 2.0 (RCS 2.0), an interface between TCP/IP and OLE automation commands in the BrainVision Recorder. During task performance, the stimulus presentation software (e.g. E-Prime, Presentation, PsychToolBox, etc.) simultaneously sends TTLs signals to the Brain Products equipment via a parallel port cable, and messages to the EyeLink Host PC via an ethernet link. The TTL signals can either be sent from the parallel port of the Display PC or Host PC. If neither computer has a parallel port then a device such as the USB2TTL8 can be used. 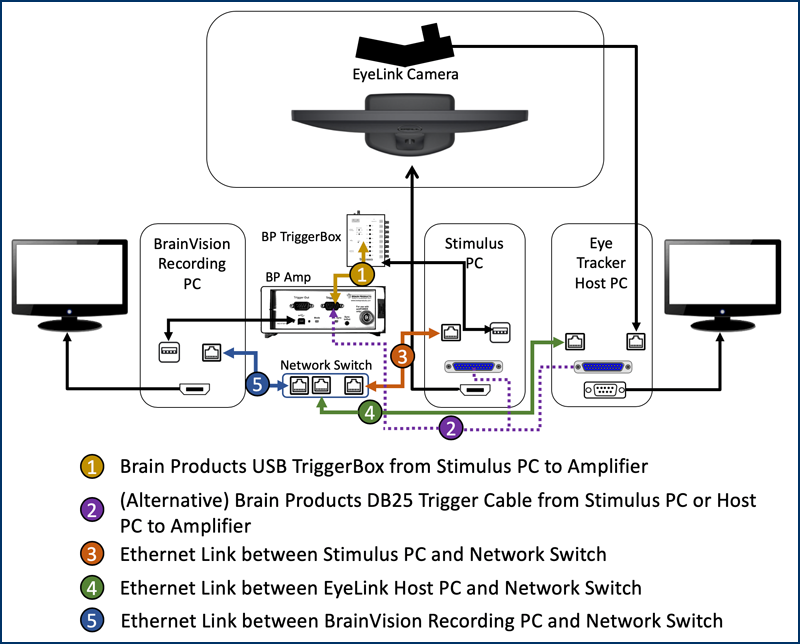 If Experiment Builder is used, control of the BrainVision Recorder PC is possible via an ethernet link. If you have any questions regarding EyeLink-Brain Products integration, feel free to contact us. We’re always happy to help.